You’d be forgiven for thinking that this was something to do with sheep, or maybe knitting or crochet, but the story is about a donkey who taught me something important. I was attending an Equine Facilitated Learning (EFL) session as a client. 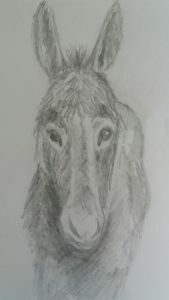 EFL is where the interaction between the person (client) and the equine (in this case – a donkey) allows gentle reflective learning. The donkey acts as a mirror. This happens under the careful supervision of the instructor / facilitator and a ‘watcher’ whose job it is to ensure that both donkey and humans remain safe and free from stress. I was asked by Sally, my instructor, what I’d like to focus upon in my session. This was easy to decide as I’d been finding it difficult to handle stress and pressure in my work and was consequently becoming increasingly reactive, which was hard to handle. To me they both looked like they’d prefer to return to their paddock. These donkeys regularly work in the Donkey Assisted Therapy Centre, where close human contact is the everyday norm, and I didn’t feel that they were particularly interested in engaging, although one of them did glance over at us a few times. After a reminder about the health and safety aspects of staying within their field of vision and not standing right behind the donkeys where they wouldn’t see me, I was invited to approach whichever of the two donkeys I chose. At this point Woollie, the larger of the two, appeared more interested than the other in that he was looking at me. So I slowly approached being mindful of my pace and to ensure he could see me easily. I went up close enough to say Hello and to stroke his neck, which he seemed to enjoy. After a short while he moved away and I returned to Sally. I was asked to reflect on the process. Before the next step, I was reminded to go to a quiet place within myself, where I could be in the moment, to be with my awareness and to breathe slowly. This time I was to go up to Woollie and simply stand nearby him without actually doing anything. Again, slowly and mindfully I approached Woollie and stood quietly in his zone. I stayed still, consciously bringing myself into what I call my neutral gear, reminding myself ‘to be’ rather than feel the pressure ‘to do’. Woollie looked directly at me and then purposefully walked over to me, where I waited calmly, somehow knowing that all was well. He came and stood right by me, so I quietly said Hello again and stroked him. He moved around, walked off, and I stayed still. He then came back, this time right up close, and then he gently snuggled his head into me, so we ended up in an equine / human embrace! It felt incredibly special – he’d actually chosen to be with me – to share a few moments of mutual warmth and connection. What had I learnt from it? Having taken a moment, I reflected that it showed me how being in that quiet, calm, ‘neutral’ place in myself had allowed the special moment to happen. Woollie hadn’t been put under any pressure. It had just happened. It taught me that I don’t have to keep trying to make stuff happen all the time; instead, I could put the pause button on, and simply wait – ready to respond if I chose, without being reactive. This was a revelation to me! Later, thinking back on the session, I could only wonder and smile to myself at how a donkey had taught me exactly what I needed to learn about the importance of inner stillness and calm. Thank you, Woollie.